leather saddles and harnesses for farmers in the area. At the age of three, while playing in his father's shop, young Louis was struck in the eye by an awl (a pointed tool for piercing holes in leather or wood). Within weeks of the accident, an eye infection took away his sight completely. Few opportunities existed for the blind at the time, so his father urged him to attend school with sighted children. He was an excellent student, mostly because of his exceptional memory. 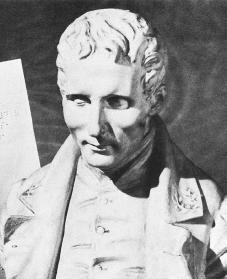 In 1819 Braille received a scholarship to the Institut National des Jeunes Aveugles (National Institute of Blind Youth), founded by Valentin Haüy (1745–1822). He continued to excel in his studies and also began playing the piano and organ. The same year Braille entered the school, Captain Charles Barbier invented sonography, or night writing, a system of embossed symbols (standing out from the surface) used by soldiers to communicate silently at night on the battlefield. The fifteen-year-old Braille was inspired by a lecture Barbier gave at the Institute a few years later. Braille adapted Barbier's system to replace the awkward embossed-word books in the Institute's library, which were the only thing he and his classmates could use up to that point. Braille began experimenting with cut shapes from leather as well as nails and tacks hammered into boards. He finally settled on a fingertip-sized six-dot code, based on the twenty-six letters of the alphabet, which could be recognized with a single contact of one finger. By changing the number and placement of dots, he coded letters, punctuation, numbers, familiar words, scientific symbols, mathematical and musical notation, and capitalization. With the right hand the reader touched individual dots, and with the left hand he or she moved on toward the next line, grasping the text as smoothly and rapidly as sighted readers. Using the Braille system, students were also able to take notes and write themes by punching dots into paper with a pointed instrument that was lined up with a metal guide. At the age of twenty, Braille published a written account describing the use of his coded system. In 1837 he issued a second publication featuring an expanded system of coding text. King Louis Philippe (1773–1850) praised the system publicly after a demonstration at the Paris Exposition of Industry in 1834, and Braille's fellow students loved it. But sighted instructors and school board members worried that growing numbers of well-educated blind individuals might take away their jobs. They decided to stick with the embossed-letter system. Braille became somewhat well known as a musician, composer, and teacher, but he grew seriously ill with incurable tuberculosis (a lung infection) in 1835 and was forced to resign his teaching post. Shortly before his death, a former student of his, a blind musician, gave a performance in Paris, France. She made a point of letting the audience know that she had learned everything she knew using the forgotten system developed by the now-dying Braille. This created renewed interest in and a revival of the Braille system, although it was not fully accepted until 1854, two years after the inventor's death. The system underwent alteration from time to time. The version employed today was first used in the United States in 1860 at the Missouri School for the Blind. Bickel, Lennard. Triumph Over Darkness: The Life of Louis Braille. Sydney; Boston: Allen & Unwin Australia, 1988. Bryant, Jennifer. Louis Braille: Inventor. New York: Chelsea House, 1993. Neimark, Anne E. Touch of Light: The Story of Louis Braille. New York: Harcourt, Brace & World, 1970.